Iceland Gull: Large, white gull, pale, pearl-gray back and upper wings. Bill is yellow, red spot at tip of lower mandible. Wing tips sometimes marked with pale to dark gray. White tail; legs and feet are pink. Direct flight with strong deep wing beats. Soars on thermals and updrafts. Iceland Gull: Breeds in southern Greenland, southern Baffin Island, northwestern Quebec, and on islands in northern Hudson Bay. Spends winters in Europe, Iceland, and eastern North America south to New Jersey. Nests on rocky coasts, on tall cliffs; prefers coastal habitats in harbors, large reservoirs, and nearby landfills. The Iceland Gull is divided into two subspecies. The western form known as "Kumlien's Gull," breeds in Canada and shows variable amounts of dark in the wingtips. The form that breeds in Greenland has no dark in its wingtips, or only very little. 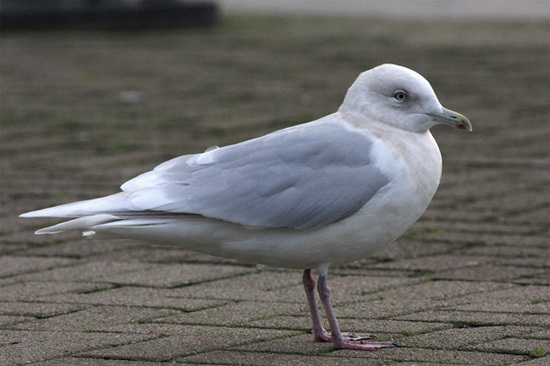 Some authorities believe Thayer's Gull is another subspecies of the Iceland Gull. Their scavenging habits lead them to frequent garbage dumps, sewage outlets and places where fish are cleaned. A group of gulls has many collective nouns, including a "flotilla", "gullery", "screech", "scavenging", and "squabble" of gulls.